A perennial favorite of A&M Records fans and collectors, ¡Something Festive! drew upon the 60s A&M catalog for ten unique takes on Christmas and winter holiday classics. For our followers, fans, forum members and friends around the world, we are offering the full album here for your holiday streaming pleasure! This is our “expanded edition” which features twelve additional A&M tracks pulled from numerous sources. Our “extras” include tracks by Shawn Phillips, Wes Montgomery, Miguel Rios, J.J. Johnson and Kai Winding, and Carpenters, along with a bonus single-only release by Claudine Longet. Tracks are captioned with song and artist information. Enjoy, and have a happy holiday season…whichever way you celebrate it! Formerly of IRS Records’ The Damned, here is Captain Sensible’s “One Christmas Catalogue” as today’s holiday feature. Offered as a bonus cassette through Target stores with her A&M Home For Christmas album, “Let The Season Take Wing” is today’s A&M rarity. Thanks to our good pal Harry for the digital transfer! Today’s wall of (holiday) sound is “Sleigh Ride” by The Ronettes. 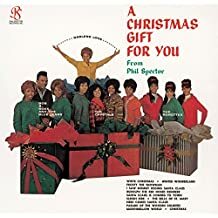 This comes from an album assembled and produced by Phil Spector called A Christmas Gift for You, which also features other popular groups that Spector produced. With the early A&M albums sharing an engineer (Larry Levine) and studio (Gold Star), it’s a natural that this familiar soundscape fits right in! Fortunately this is readily available on CD, and can also be downloaded in a high-res version from HD Tracks!